Should you accept programmatic ads in your publication? They say there's a bonanza awaiting publishers from "programmatic advertising." In the last issue of STRAT, our lead said, "They say there's a bonanza awaiting publishers from 'native advertising.'" So it seems there are a lot of bonanzas awaiting publishers. Most involve very impressive innovations spawned by the emergence of digital publishing. It's worth asking how many of these innovations will ever live up to the hype surrounding them. In all candor, I've found that they contain a strong element of unfounded hype and a weak component of demonstrable efficacy. Even worse, there seems to be a deliberate intent to mislead. A recent Advertising Age story is a case in point. The headline reads, "Mobile-Ad Revenue Explodes, Finally." Adjacent to the head is a chart titled "On the Move" that covers the years 2012 to 2017. 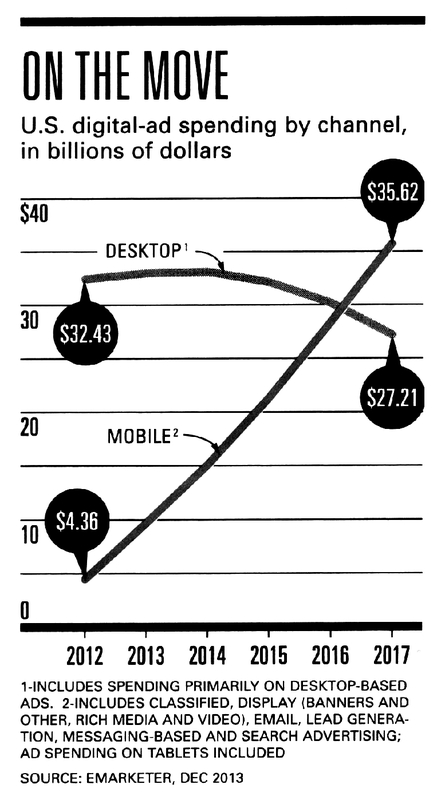 One curve labeled "desktop" shows a modest decline in "desktop" ad spending. Another shows a dramatic boom in "mobile" ad spending. The visual coupling of the headline and the chart certainly makes an indelible impression. Any publisher might take away from this that going after mobile ad revenue is an urgent priority. But if you look at the whole chart, including the fine print, that message is not nearly so strong. First of all, the article plays a trick on readers with its definitions. "Desktop" is what it says it is: advertising aimed at consumers using desktop computers. But "mobile" isn't simply mobile. That dramatically upward curve includes "classified, display (banners and other, rich media and video), email, lead generation, messaging based and search advertising" and it includes tablets. What's more, only the 2012 data point is entirely data-based. The data points for the other years (2013 to 2017) involve an element of speculation. Ad Age is generally a good magazine, one that we rely upon a lot for industry news and statistics. My point here is not to denigrate the magazine. But this one article stood out as being representative of the kind of hype we see in many venues that encourages unjustifiably high expectations for innovations that lack a track record. I encourage publishers to explore all the innovations that are coming along. But I see all too many betting their futures on things that may turn out to be just hype. "Programmatic buying basically involves using an automated platform to buy ad impressions. You enter in your customer data, budget and campaign objectives. The programmatic buying platform does the media buy for you based on an auction for available impressions, taking into account the data you entered. The platform also matches up the ads each user sees with the available customer data. The idea is that each Internet user will see an ad that fits their specific needs and interests. For buyers, this means that they only pay to reach the clients they want to reach." Like native advertising, this innovation started out in the digital world. And, as with native advertising, there are those wishing to import programmatic buying into the print world as well. Programmatic advertising offers publishers a few strategic problems, whether we're talking digital or print. First of all, a programmatic platform can stand between the publisher and the advertiser. At most successful publications there's more to that relationship than simply the deal to buy. Publishers can provide both qualitative and quantitative market insights that advertisers can use to hone their ad messages. In turn, advertisers can give publishers insights into the market from an advertising point of view, which can help publishers focus audience development in a direction that will be mutually beneficial. Second, if the decision to place an ad is reduced to an algorithm, people will find ways to game the system. A whole industry has developed, for instance, to help clients game Google's search algorithm, a practice euphemistically called "optimization." But I think you get the idea. Third, it's hard to imagine that an algorithm can take into account all the factors that go into a really smart ad buy. Two magazines, for example, can have almost identical demographics. But one magazine could have earned a high level of reader trust and respect. As a result, its readers may have a high propensity to buy what they see advertised in the magazine. The other magazine may be a fly-by-night publication with low-quality content and little reader loyalty and trust. If the latter offers the best price, which one will the algorithm chose? Fourth, what about repeat exposure? If ads are going to bounce around to wherever the right demographics can be found at the best price, will advertisers lose the benefit of repeat exposure from running contracts with hand-picked publications? That would yield ads that are less effective, and if advertisers find that their ads are becoming less effective, will that result in reduced budgets? Fifth, it's worth remembering that, for many readers, ads are content too. One reason some consumers read a given magazine is that the ads interest them. With conventional ad selling and buying, the publisher can exhibit a level of control over what kind of ads are solicited. In a sense, the complexion of the ads contributes to the character of the magazine. If, as some hypesters predict, most advertising buys become programmatic, publishers will lose control of what they're delivering to readers. That might even cost them some readership. So that's the programmatic advertising dilemma. As a publisher, should you sign up and begin taking on programmatic buys? That may seem like an attractive proposition for a publication that has had trouble selling ad space. However, will that move bring in short-term revenue at the expense of long-term interests? Perhaps finding ways to increase the effectiveness of your conventional ad sales efforts might be a safer bet? I think it probably would. But maybe you could do both! If you were to control or limit the extent to which your publication carries programmatic ads, and boost the effectiveness of your conventional sales at the same time, you could have the best of both worlds. In the news: Hobby magazines were one of 2013's publishing success stories. As the magazine industry continues to adapt in the digital world, one sector has been performing particularly well: hobby magazines. In a December 27 New York Times piece, Christine Haughney discusses the recent successes of hobby magazines. This prosperity in a troubled marketplace suggests a possible subscriber shift from general to niche magazine titles. Among those hobby magazines performing well are Wine Spectator, Cycle World, and Cigar Aficionado. These magazines are thriving thanks to loyal subscribers, circulation growth, and in some cases subscription rate hikes. In a time when magazine staffs are shrinking, some successful hobby magazines are even adding new editors. Read more about the success of hobby-oriented publications here. A recent TheAtlantic.com headline asks, "Can Print Magazines Save Themselves?" Writer Peter Osnos concedes that, at least for the time being, "the prospects for print are generally gloomy." However, he isn't writing off the print magazine industry just yet. If print magazines can maintain their quality and charge readers enough for their content, they stand a chance. Read his analysis here. There has been a lot of bad news for print magazines this year, and this has led some analysts to write them off as an endangered species. As Matt Pearce of the LA Times writes in a recent article, "Conventional media wisdom maintains that print is headed remorselessly toward extinction, with many old-school publications continuing to struggle and, most recently, the legendary weekly magazine New York announcing that its print edition would soon go bimonthly." But, as he notes in his article, the print landscape may not be as bleak as some pundits suggest: this year, several online-only publications (including Pitchfork) developed print editions. Read more here. There's more potentially good news in the print world. Newsweek, which shuttered its print edition last year, has announced plans to revive its print efforts. The publication plans to charge readers premium subscription rates for the print edition to remain solvent. Read more about Newsweek's renewed print initiatives here.